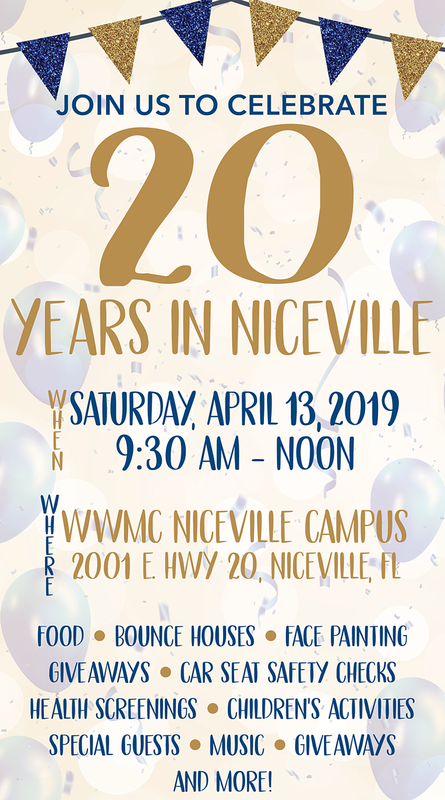 Join us Saturday, April 13 at the White-Wilson Niceville Campus to celebrate 20 years of serving Niceville families. From 9:30 a.m. until noon we will host family-friendly activities. There will be free health screenings, food and door prizes. For the kids, we will offer face painting, bounce houses and games. You can even check out the North Bay Fire District's truck and expect a visit from Northwest Florida State College mascot, JR. Be sure to take advantage of free car seat safety checks to ensure your little ones are buckled safely. Q92-Hit Music Now will be broadcasting live all morning!